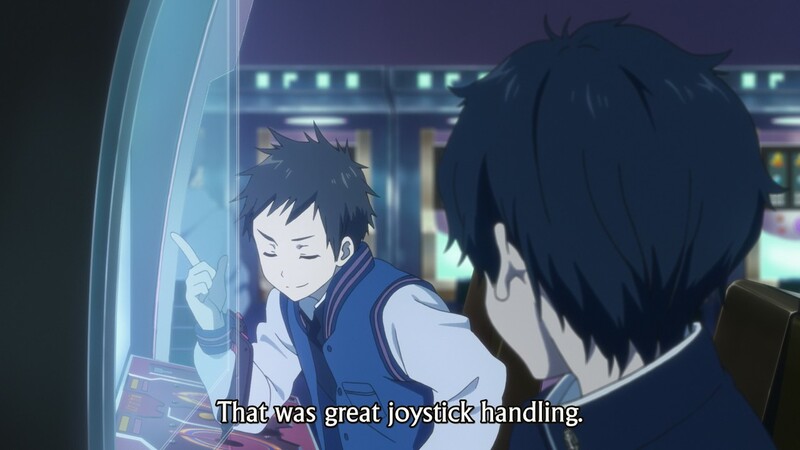 Hyouka has been accused at times of being overly juvenile. Focused as it is on the lives, feelings, and concerns of high schoolers—jealousy, heartbreak, pettiness, bravery, thoughtlessness, fear—for some (and even some in the comments sections of this series of posts I’ve been writing!) it treads too deeply into the forest of adolescence and loses its relevance. While I understand people hold this sentiment, I must admit I find it to be, at least as far as my own experience goes, fundamentally incorrect. I’ll admit—I’m only twenty-three years old at the time of this writing and I have a lot of of the world yet to see. I’m not all that distant from the experiences of high school life. However, in my short time out there in the “real world,” it seems apparent to me that adults are really nothing more than children, forced by circumstances to pretend they’re not. We never come to place where we cannot grow anymore—to think otherwise is foolish. I say this all not with the intent of berating those who doubt Hyouka‘s applicability to people beyond the grasp of high school youth. As I’ve said, I have much to learn. 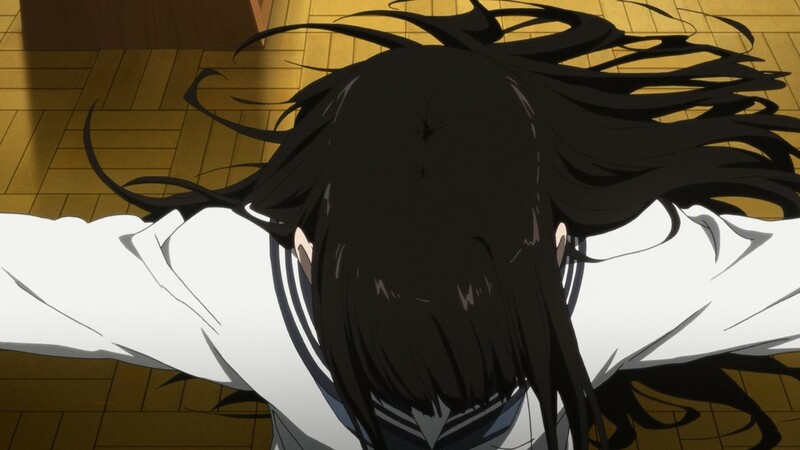 But to see this episode of Hyouka as anything other then unequivocal proof that it understands not just teenage life, but the experience of being human… I’m simply not capable of that right now. 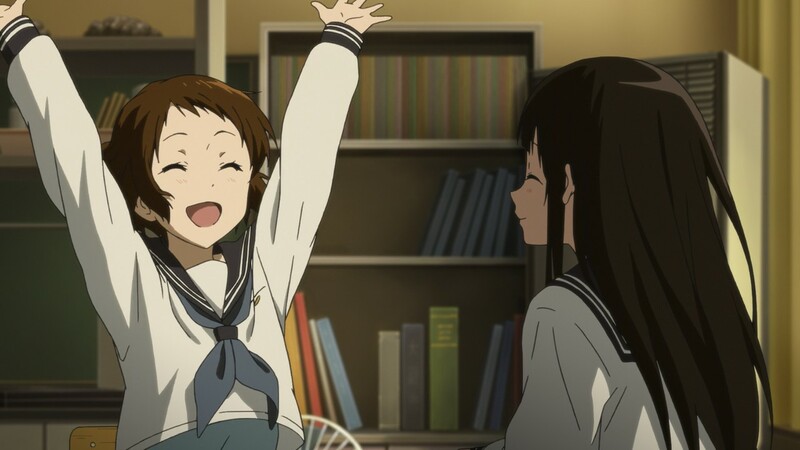 And so begins Hyouka‘s twenty-first episode, with a flashback to a time even more mired in the trappings of childishness—and yet still no less real in its depiction of the pain we can cause each other. 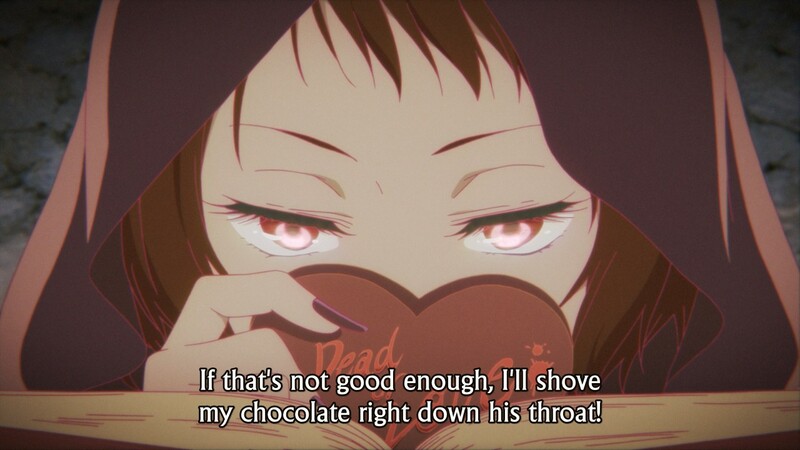 Middle school Mayaka is angry because she’s been hurt by middle school Satoshi’s sad joke of an excuse for rejecting her Valentine’s Day chocolate, and she carries this passion into the current iteration of herself. 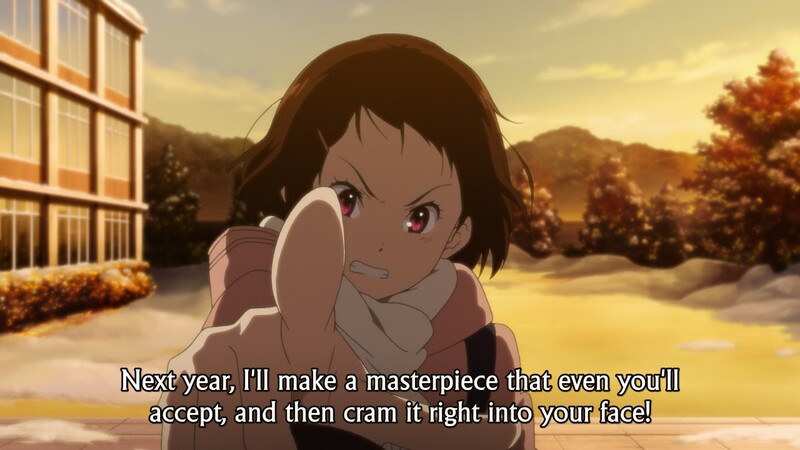 Oreki’s vivid imagination (and indeed, the explicit tie between the humorously overwrought scene of the femme fatale Mayaka capturing Satoshi and his outward reaction confirm for certain that all along these imagistic scenes have been drawn from Oreki’s mind) paints the picture of how driven Makaya really is. 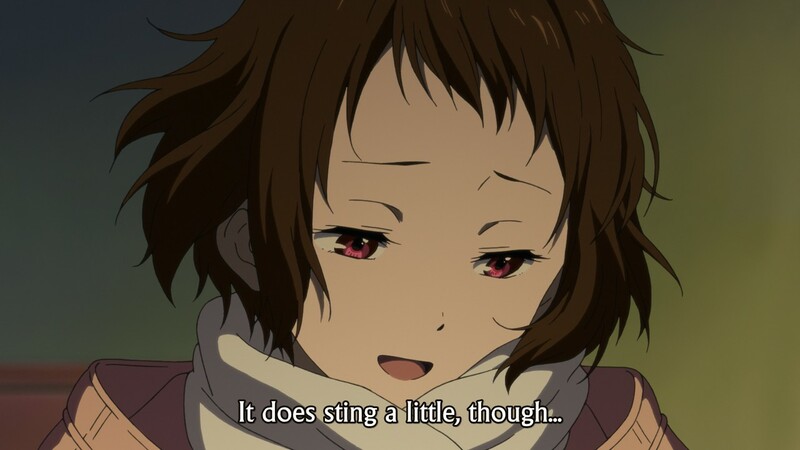 Mayaka is a simple person. She’s forward in the expression of her emotions, unafraid of being herself, and knows exactly what she wants. It’s not the kind of “adult” confidence that might insulate her from outside pressures (we saw as much in the Kanya Festival arc); it’s simply her strength of character and personhood. Mayaka’s personal cinematographic language supports this: it’s straightforward, unsubtle, and clear. 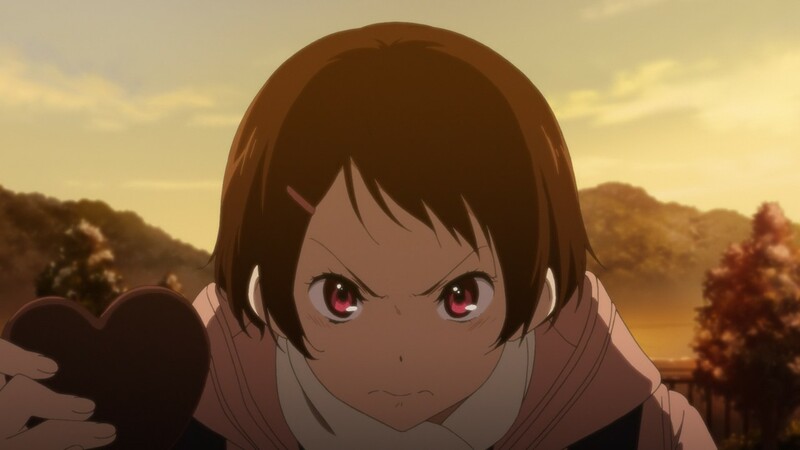 Why doesn’t Mayaka ever really get a full character focus episode? Because she simply doesn’t need one. 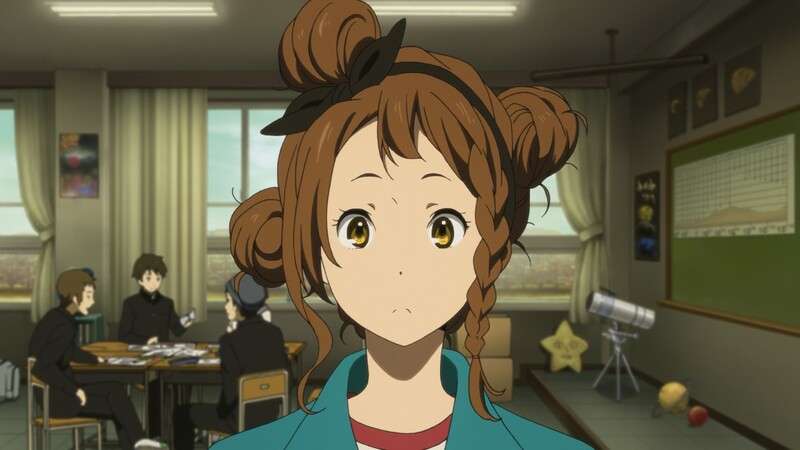 Mayaka more or less lets everyone know what they need to know about her. It’s daring, and admirable. 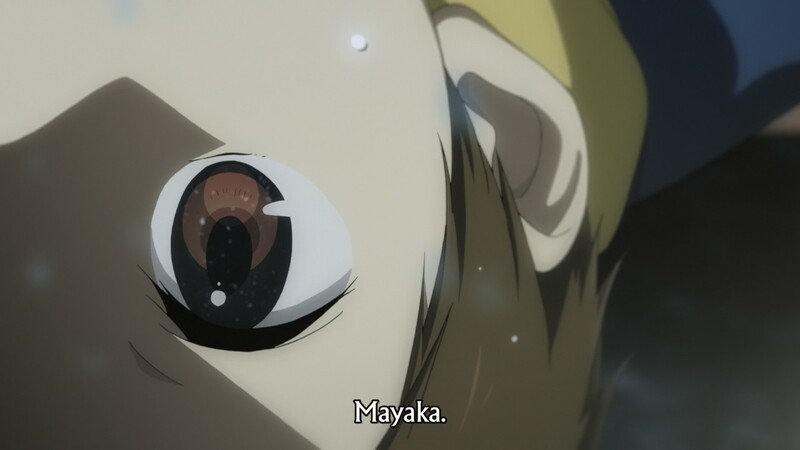 This isn’t really to say Mayaka isn’t a complex and full character—she is. Rather, it’s merely to say she shares her complexities with the people around her. It’s her being vulnerable—and that kind of vulnerability, sadly, can sometimes get you hurt. 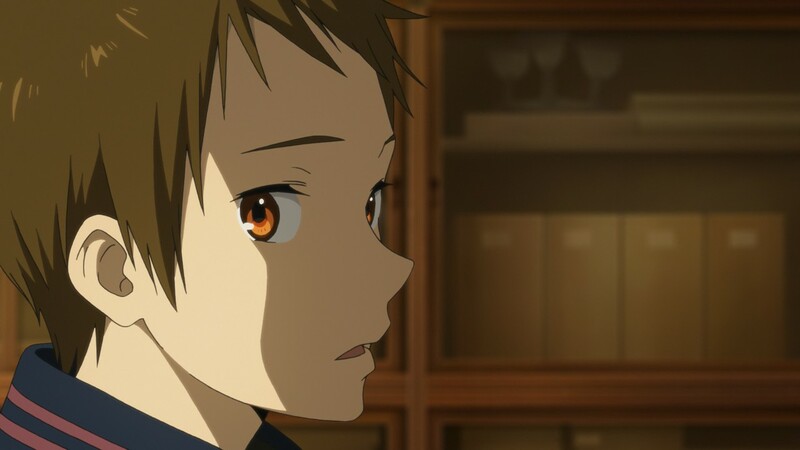 By way of contrast, the boy who Mayaka loves is a true enigma. Even his truth-tellings are riddled with complexities and layers. And furthermore—as two parallel shots show—he’s no longer the same person he used to be. It’s not really stated whether or not Mayaka fell in love with Satoshi before or after his change, but I’d place my bets on the latter. 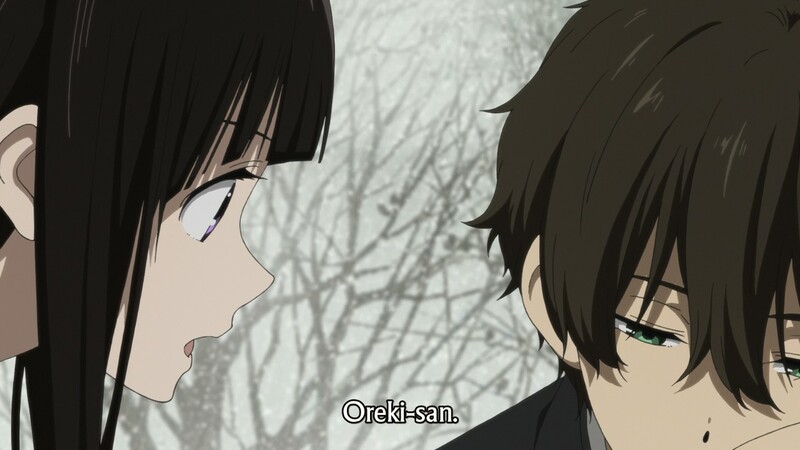 [1/2] It starts with two parallel shots, as both Oreki and Chitanda tease each other good-naturedly. 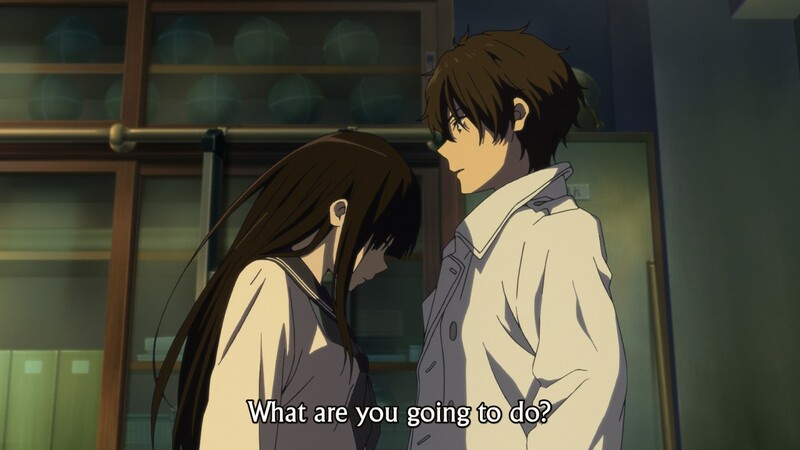 [2/2] Chitanda’s shot is basically identical to Oreki’s as she responds with teasing of her own; these two have never been so much on the same wavelength with each other as they are now. 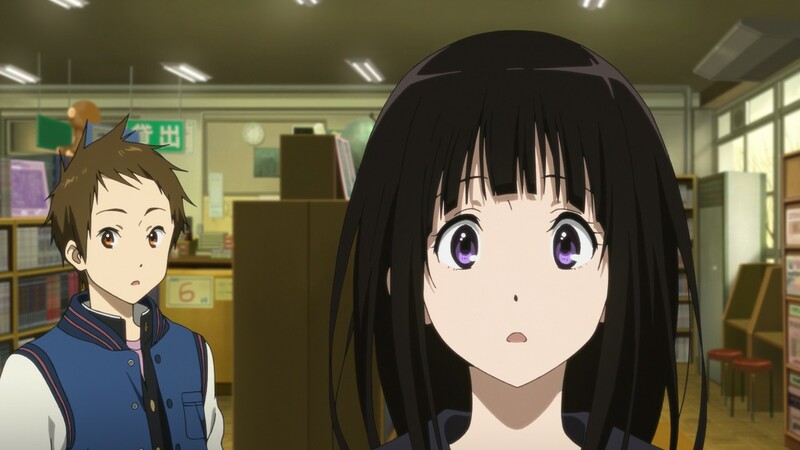 [1/2] As Chitanda reflects on what she’s just seen from Mayaka (and there’s definitely a wistful sentiment there), Oreki looks on. [2/2] We then cut to this shot—one more or less identical to Chitanda’s prior shot. It’s a reversal of the way the two of them were paralleled in the first shots of the sequence, but only in order. 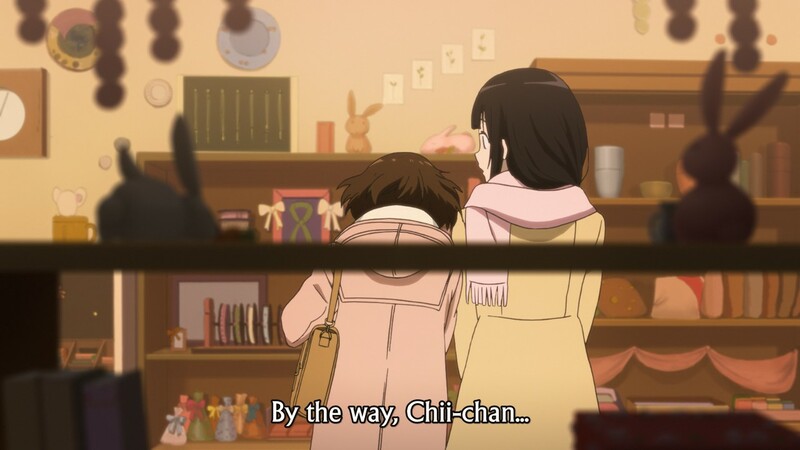 However, note that Chitanda starts this line of conversation. A simple medium long shot, and we see how close they’re standing together. A comfortable, familiar, and friendly distance. And then we dive into the real weight of the sequence, as Chitanda leads in with a straightforward shot. Oreki’s shot is closer; he can’t help but be drawn in by this topic (of course!). 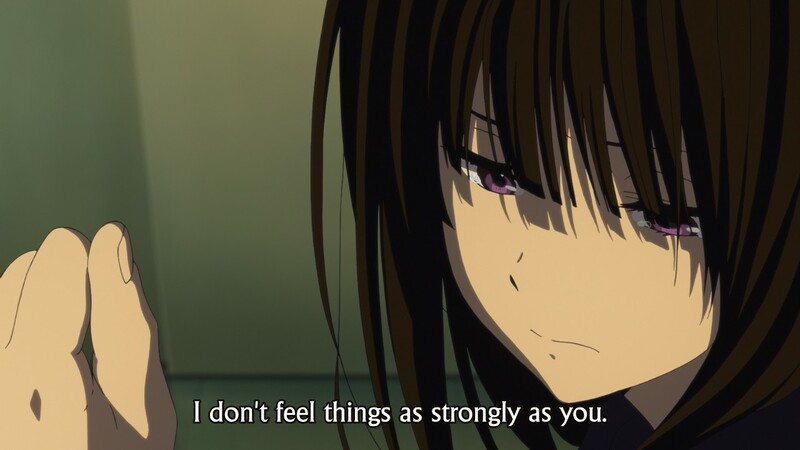 And for Chitanda, as the close-up indicates, this is something important to her as well, even as she explains why she won’t be giving him chocolate—in effect, letting him know how important he is to her. 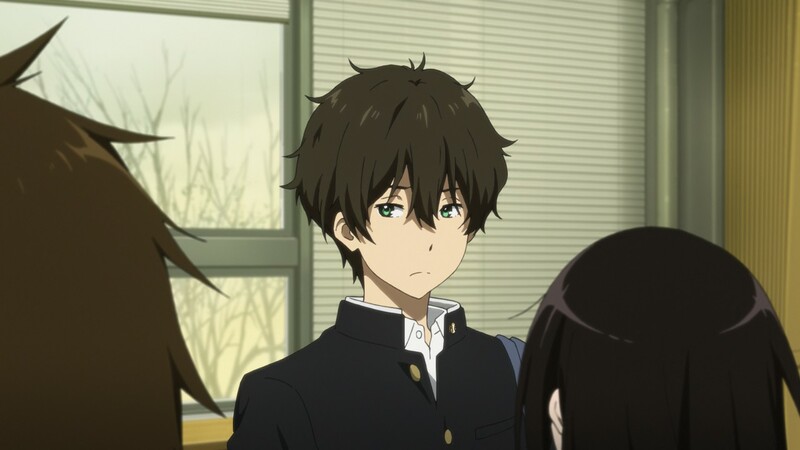 And Oreki continues to make the same face, but he’s being drawn in further, even if he can’t respond. The same reflection of the other in their eyes, the same blush on their cheeks. Do you doubt they both understand? 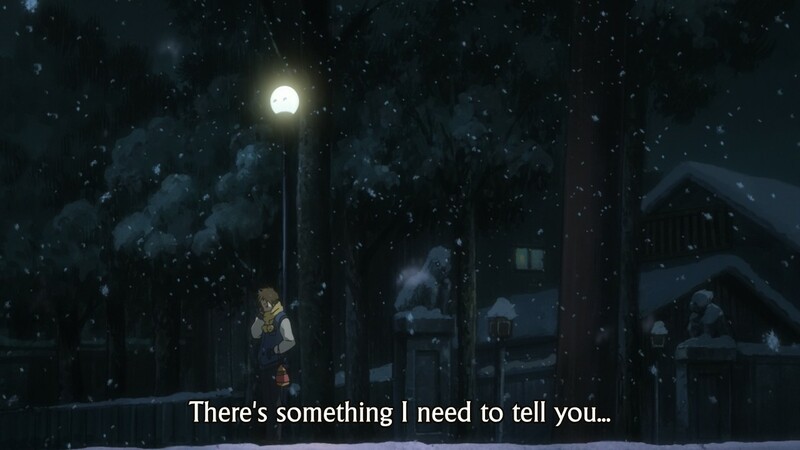 Oreki wants to ask what it means—ha!—but the intimacy of the moment is broken by the guy who literally walks into the frame of their conversation. It’s a long shot; the parallel close ups are gone. Distance has been reimposed. [1/2] Chitanda smiles, but nearly half the screen is filled up with negative space, imply distance. [2/2] Across the cut (more distance), Oreki has the same shot, the same negative space. And as they continue on, the gap between them is a bit wider, the balance of the shot’s composition thrown off by the outsider (to their relationship) in the foreground. The profile shot and its use of negative space (as seen in shots 13 and 14) will reappear throughout the episode, implying distance again and again. 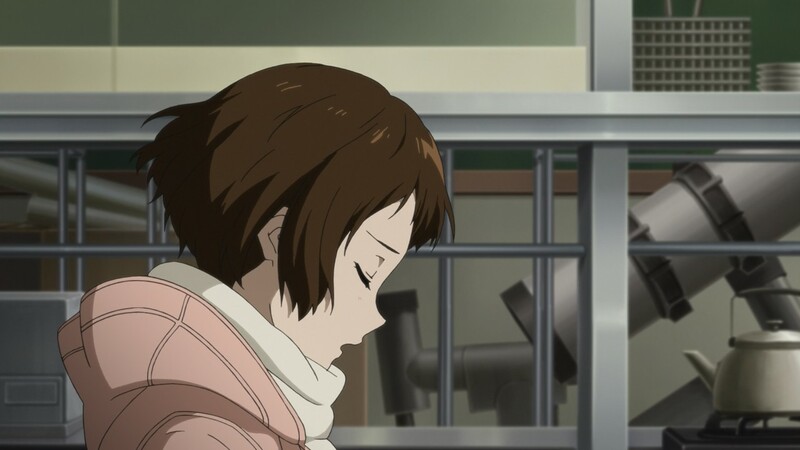 We see it as Mayaka delivers her chocolate to the club room, combining the complex composition of the background (a tangled up situation, for sure) with the other characteristics of the shot; and with Satoshi as Oreki wishes him good luck. 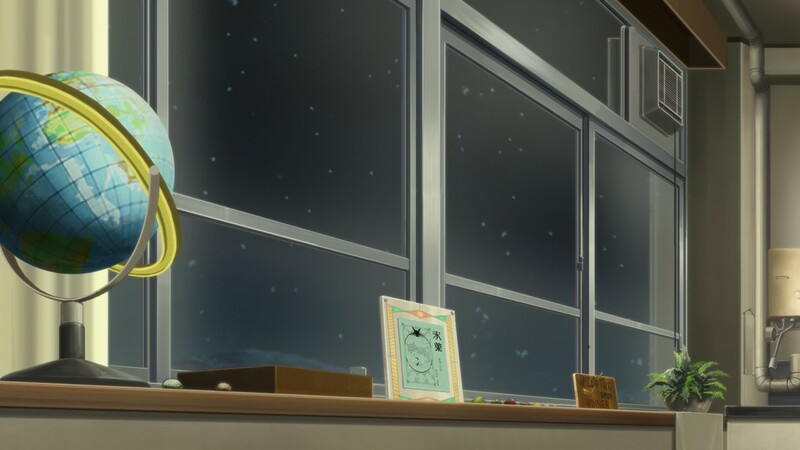 Satoshi and Oreki’s conversation also introduces the main visual motif of the episode: windows. While it’s somewhat difficult to pin down in definitively concrete terms the exact “meaning” of the windows in this episode, I think they can be generally understood as a couple of things: A) representations of distance, B) symbols of “inside versus outside” in emotional terms, and C) as things that let in light (that is, truth). Transparency. A critical symbol for an episode based around the central conceit of Satoshi coming clean—letting the light that has shone on him only in halves to finally illuminate fully his secrets. Of course, these kinds of things don’t happen just at a distance, though glass. This is something that involves all four members of the Classics Club. 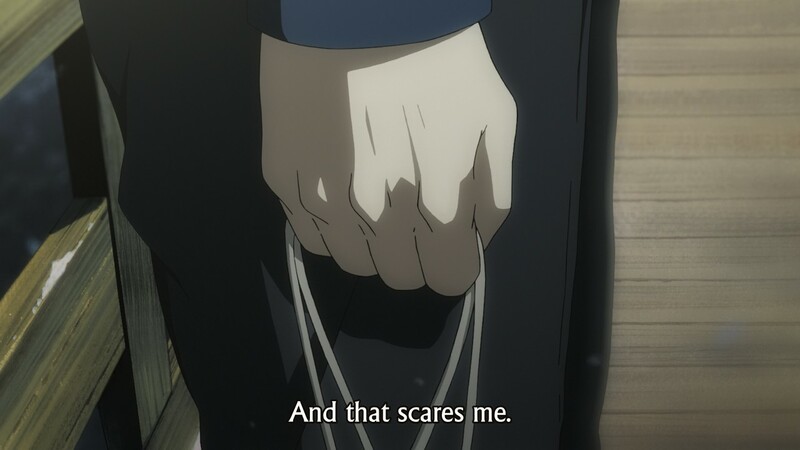 Chitanda has involved herself with Mayaka at Mayaka’s request, Satoshi is involved whether he likes it or not, and Oreki ultimately makes the choice to involve himself because of Chitanda. 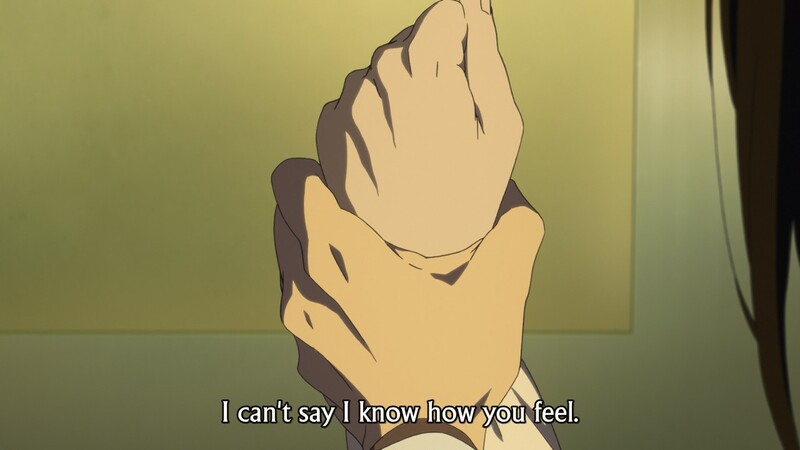 Why can’t Oreki just step aside—knowing as he does that this is really something between Satoshi and Mayaka? Because of Chitanda. Because of the immediacy and urgency and personal investment that she brings into the situation. Because he’s close to her, because she’s hurting, and because he is no longer the sort of person that can ignore that. As Chitanda steps in front of him to block his way—and, notice, there are not longer any sort of mystical-magical elements to her plea like there were early on in the show—the immediacy and force behind her request make obvious through the abruptness of the cut from close-up to long shot. This is not the same sort of insistent, charming, intimate pushiness we’re used to seeing from her. It’s something different. 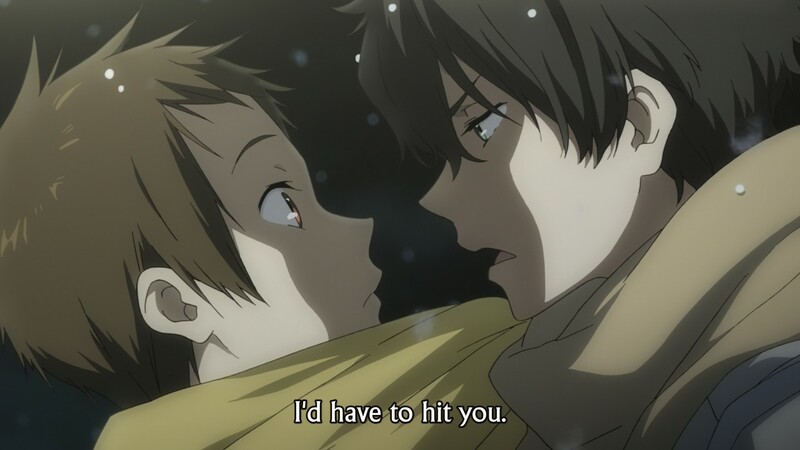 Oreki notices, and moves—surprising even those who know him best. The mystery then takes focus for a while—featuring the delightful reappearance of an irate Sawakiguchi and her incredibly powerful hair—but then Chitanda leaves the room and all that’s left is the detective and the culprit. 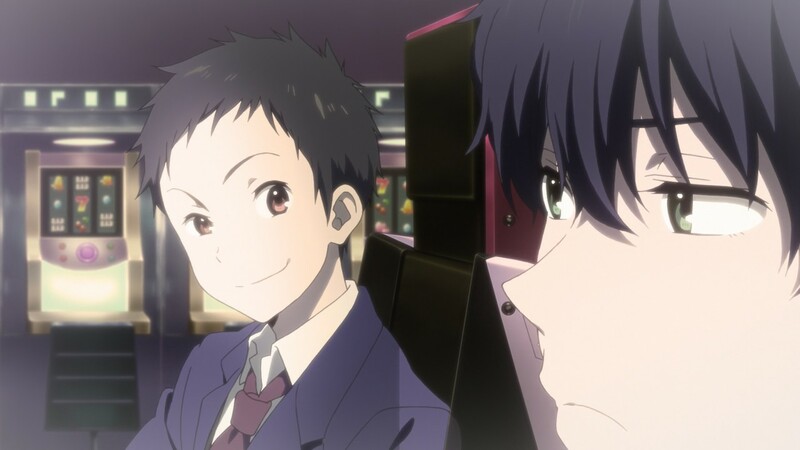 As Oreki will later reveal, he solidified his initial suspicion of Satoshi long before the confrontation with the Astronomy Club. Everything after that, until Chitanda leaves, is just a performance for her benefit and her benefit alone. In other words, Chitanda—and Chitanda alone—is Oreki’s priority at this point. He doesn’t have the patience or the breadth of care to coddle Satoshi’s acting; his sole concern is Chitanda and her feelings. This will lead him to echo the same close-up/long shot sequence that Chitanda used to block him in the library. It was in that moment that his concern for Chitanda brought him into this mystery; and it is in this moment that this concern causes him to keep her from doing something she will regret. And it is all this that will cause him to snap at Satoshi’s idle chatter. It’s a mere seven shots, but it’s harsh, unfriendly—and it shuts Satoshi up. (1) It begins with a fairly even-keel shot of Satoshi in the middle of the screen and an unremarkable medium close-up, trying to preserve a sense of normalcy. 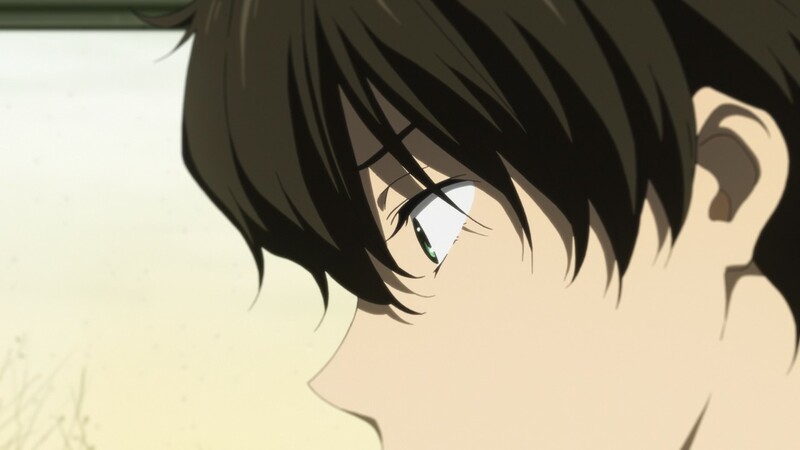 (2) But Oreki cuts through the casual noise with an unbalanced close-up that emphasizes his frustration. (3) And Satoshi is shocked, arrested, chastised. His easygoing act has been torn to shreds. The close-up parallels Oreki’s, but its as if Satoshi has been forced into it. 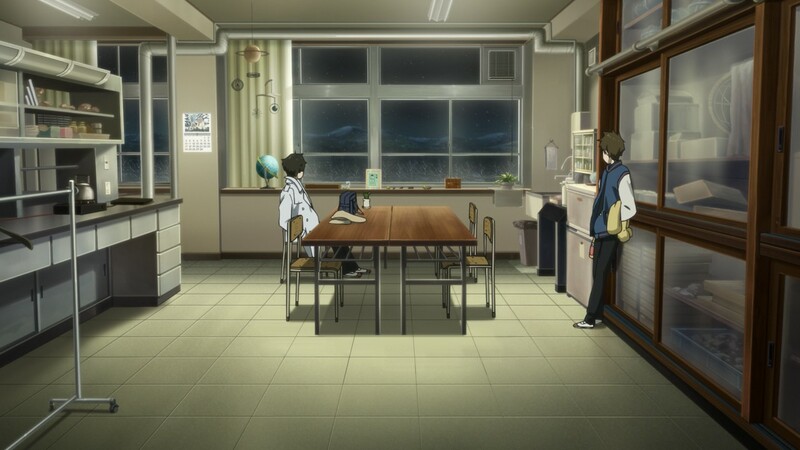 (4) As Oreki speaks, we see the distance between them. 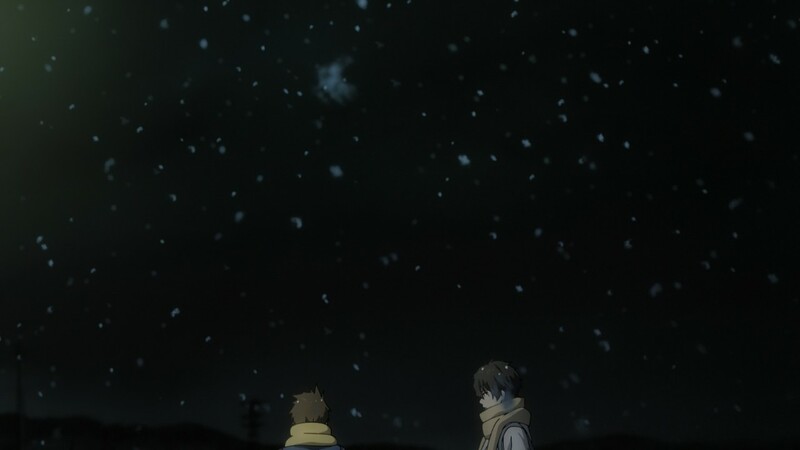 (5) And the profile shot with the negative space reappears—cold, as Oreki effectively tells Satoshi to shut up. (6) And Satoshi can only acquiesce, shuttered into a corner of the screen. (7) We see Oreki, but Satoshi is all but blocked off. The abruptness of the cuts mirrors Oreki’s potent fury; and all falls silent. 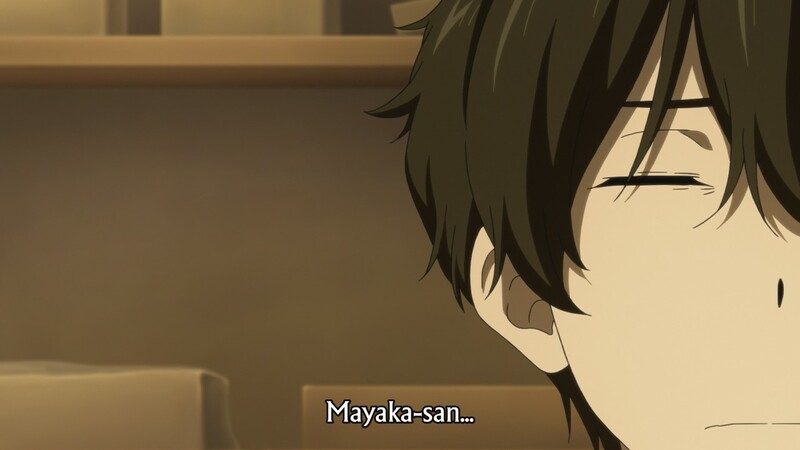 So, as Mayaka shows up and departs, Oreki shows once again how much he’s grown. 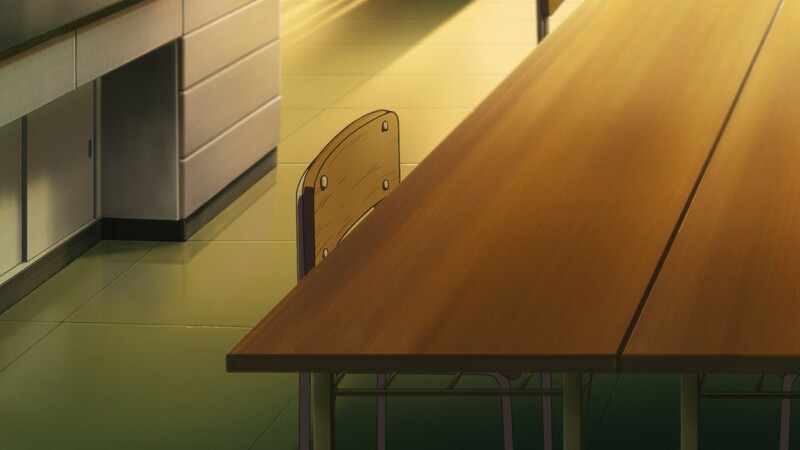 He stands before Chitanda, refuses to let her leave even as she feels the agony of what she thinks she’s done, represented by Mayaka’s empty chair. But if Oreki returning the blocking favor shows that he cares, it’s what he says to get Chitanda to really let go that demonstrates his growth. This is broad-faced honesty. A critical understanding of himself in relationship to someone he cares about. And so, as he concocts a lie to resolve the problem, he asks Chitanda to trust him. He cannot tell her everything, but he shows that he cares—and requests that she let him show her that it’s true. And she trusts him. So she goes. With Chitanda now gone, the windows motif returns—after all, the truth is about to be revealed. And once again, we find ourselves on a bridge, on a path between one shore and another. It’s an apt metaphor for this encounter (and a bridge will play an important role in the show’s finale, as well), as Satoshi truly is dwelling in the in-between. As he says, “I think I’ll have an answer soon.” He cannot dwell in-between for much longer—the world, and other people, aren’t so convenient. To make that move, Satoshi spills out everything. The emptiness he feels knowing he’ll never be the best at anything (the emptiness of the sky above him). 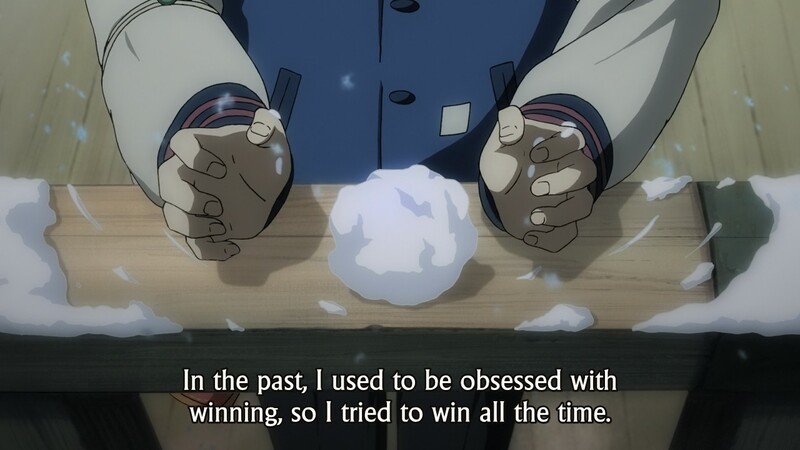 The cold feeling of his past life (the snowball). The exuberance, yet uneasiness, of his current life (a joyful shot, but upside down). 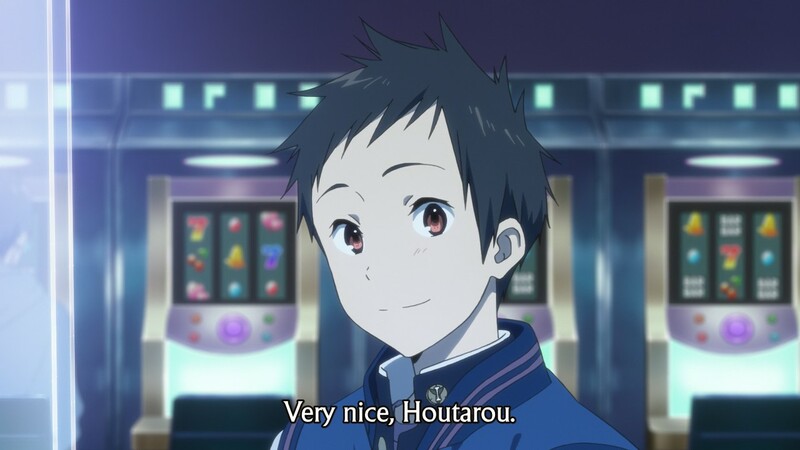 The attractiveness he sees in Mayaka (a romanticized close-up of his eye). The vastness of his fears (a giant empty sky in which he is small), and the closeness of them (the close-up of the bag with the chocolates). The sky becomes a metaphor for Satoshi’s uncertainness of the huge scope of an unknown future. And that is not a worry exclusive to adolescents. The fear of the future, the fear of the unknown… show me a human who has mastered these and I will insist they are either a saint or insane. We flail against the terror of the thing we cannot control—the flow of time and what it brings—digging in our heels, worrying over the opportunity cost of our lives, seeking to manage every instant of our lives. Perhaps it is the youth who, by virtue of their age, instinctively understand they cannot control the future (and thus fear it) who are more real than the adults. The paralysis of this… it is natural. That Oreki is the one to whom Satoshi spills this all out… it’s a humiliating experience for Satoshi for sure. But he knows he’s in the wrong, so he takes threats of punches and all in stride—until Oreki says something unfair, speaking out of his own emotion. 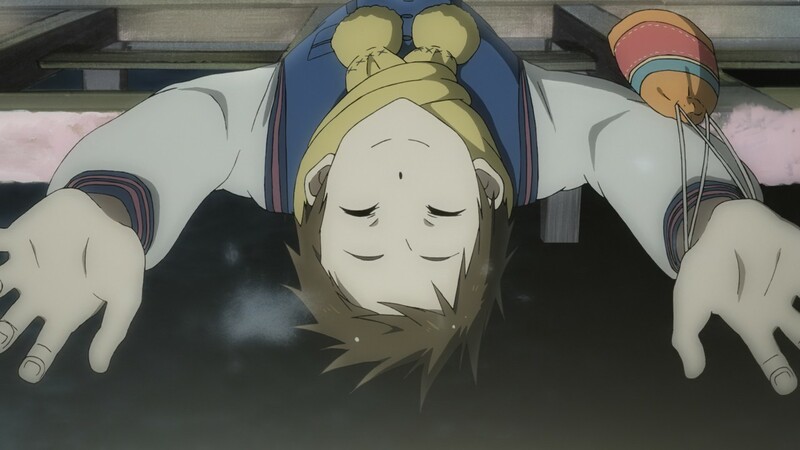 Oreki, backed by the structure of the bridge as if supported by his talent, accuses Satoshi of the incidental hurt he caused Chitanda, while behind Satoshi stretches the empty blackness of the river (a substitute for the sky). There’s a lot that’s similar between these two, but Satoshi is always feeling the difference. What he says is a petty, catty dig, but it’s also fair. 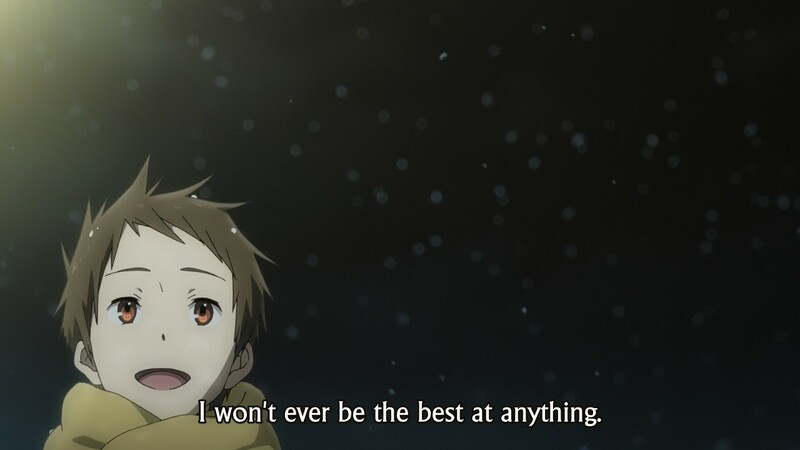 Oreki’s demanding things of Satoshi that Satoshi can’t give, holding Satoshi accountable to the same standard of talent he himself has ignored for almost all of the series. And sure, Oreki is lashing out because of his own pain vis-a-vis Chitanda—but that really only grants Satoshi permission to respond in kind, just with more resignation. 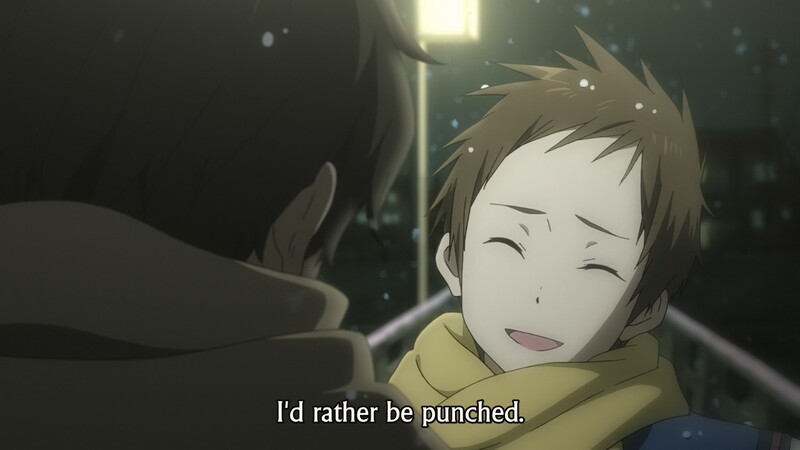 “I’d rather be punched,” Satoshi responds to the idea of Chitanda hearing all this from Oreki, as they two of them split the screen evenly, emphasizing their similarities once again. Final Notes: There is still much I could say about this episode. Meaningful shots and sequences, little bits of character work that I glossed over, and more. This episode is absurdly, unfairly packed with stuff. It’s likely among the single densest episodes I’ve ever tried to write about. I’m sincerely sorry I couldn’t tackle it all here, but to even attempt to do so would be a fool’s errand. I hope you’ve enjoyed what I’ve put together here about this wonderful, bittersweet show. It wasn’t easy. It was kind of painful to write about—but I think I’ve maybe, just a bit, done it justice. 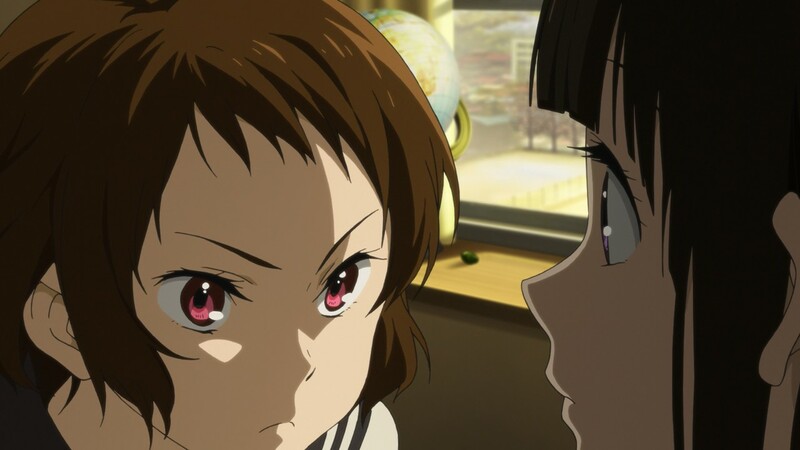 Personally, I’m always impressed by your Hyouka episode write-ups. I think the series is such that there’s probably always more anyone could write in any given blog post, because it’s just packed so full of stuff – some episodes more than others of course, but as an overall show as well. So I think doing these types of posts justice would be pretty tough by anyone’s standards, but if my opinion counts for anything, I genuinely believe you’re doing an amazing job of it. Thank you very much for saying so! 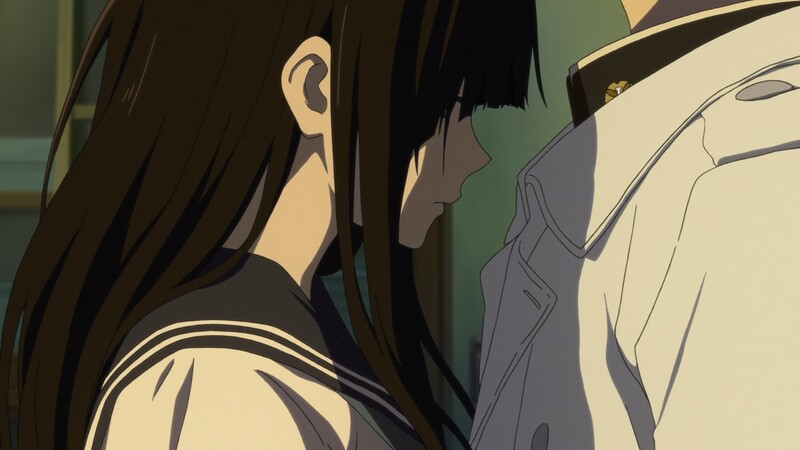 I really do appreciate that; Hyouka‘s a show that makes me feel inadequate as a writer a lot of the time haha. I’ve been looking forward to your writeup of this episode ever since I first saw it a couple of months ago. You did it justice – like you said, there’s way too much here for even a blog post to cover, but I think you chose a great angle to approach it from. Another interesting angle is looking at the issue of deception. “O what a tangled web we weave,” as the line goes. It’s often easy to justify deceptive actions thinking “this is harmless,” or “it’s just between the two of us,” without thinking about any ripple effects on the people around us, since 99.9% of us don’t live in a hermetically sealed bubble. 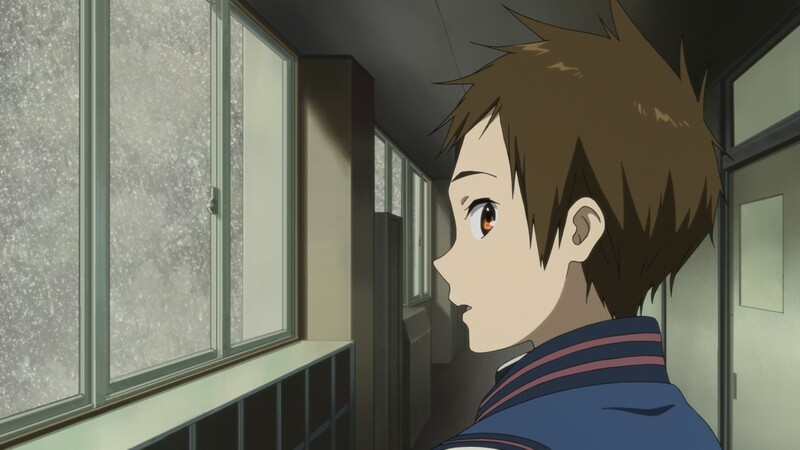 Obviously Satoshi was sending a message to Mayaka, choosing a third option between “take it” or “leave it” to tell her he still didn’t have an answer for her (and from her reaction it seems like she got the message), but as he says, they were so focused on their own issues that neither of them ever stopped to consider poor kind-hearted Chitanda, who just wanted to help out her friend and ended up being the real victim in the whole thing. This is the second time she’s been victimized too, after the Silk Spider incident (which is brought up again just to drive that home). But you could tell Oreki felt guilty about that one even as he was doing it, and here the more mature Oreki doesn’t even try to hide his emotions. I get the sense that he, at least, isn’t going to use deceptive tricks again in the future. I get the sense that he, at least, isn’t going to use deceptive tricks again in the future. That’s not so clear. After all, Oreki deceives Chitanda in this episode when he lies about who stole the chocolate. And fundamentally he does this to protect Fukube, I guess because he can’t bring himself to humiliate his friend in front of Chitanda. Rather Japanese of him, I imagine. On the other hand, I’m also inclined to think that part of the reason Oreki is so angry at Fukube is because Fukube has compelled him to lie to Chitanda, so I’d agree that Oreki is less likely to try to deceive Chitanda now than he was in the first episode. But there’s a massive difference of motive and rationale. When he deceived Chitanda before, it was a cowardly trick pulled for selfish reasons – he didn’t feel like solving the mystery he knew she was going to ask him about, but he wasn’t brave enough to refuse her directly. 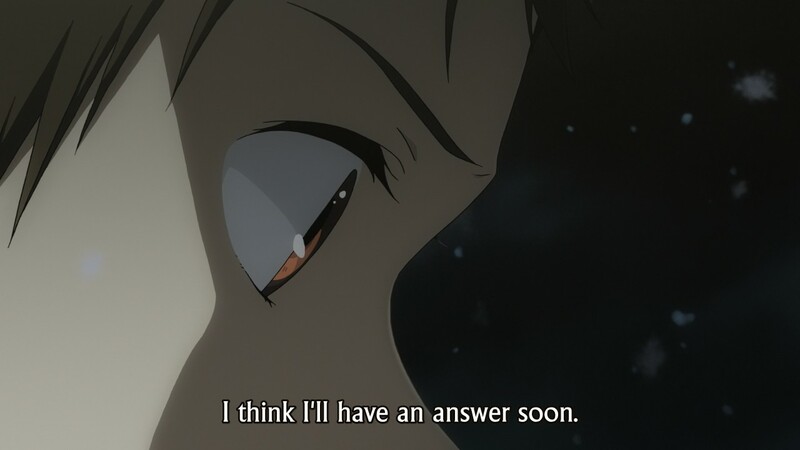 Likewise, Satoshi’s deception in this episode was also a cowardly trick pulled for selfish reasons, to try to weasel out of giving Mayaka a straight yes or no answer (with Chitanda once again the unwitting victim). 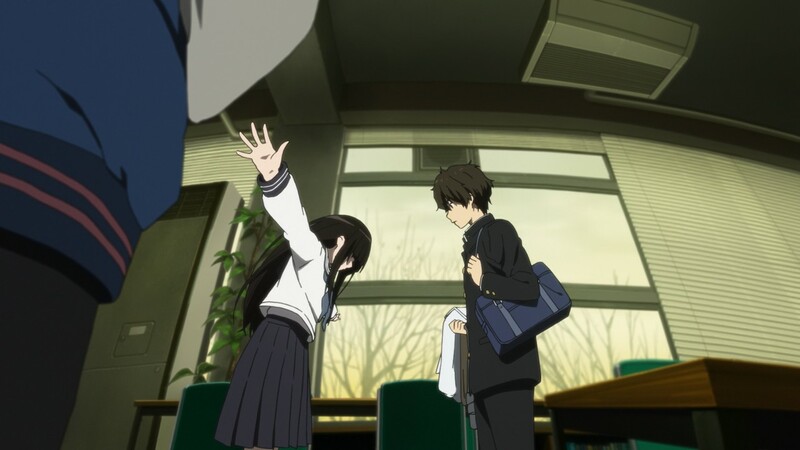 Oreki’s lying to Chitanda here isn’t at all the same thing as those two – he’s trying to be proactive in dealing with the situation while a) sparing Satoshi’s honor and feelings, b) not inciting a confrontation that might create bad blood between his two best friends, and c) (as bless noted) making sure Chitanda doesn’t do something she’ll regret later. 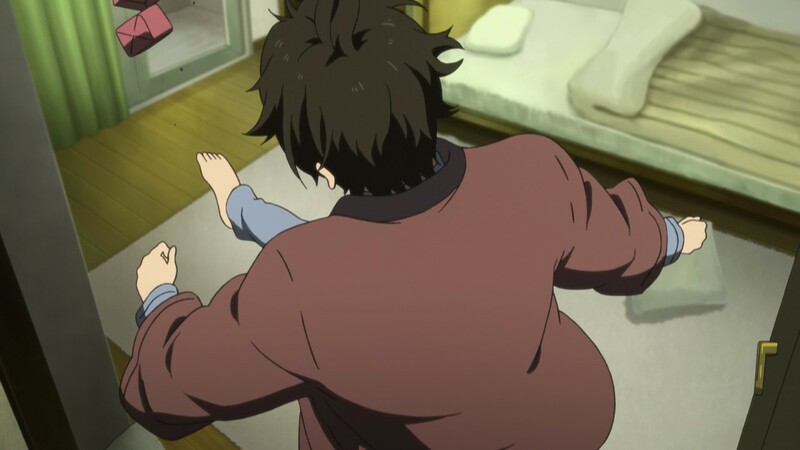 The only lie he tells is his fake conclusion about the culprit – what’s stone-cold truth and more important is his promise (one the old Oreki never would’ve made) that he’ll clean everything up if she’s willing to trust him, and he does exactly that. Once Mayaka comes clean, I think Chitanda intuitively understands all of those things and that his motives came from a good place, and that’s why she’s genuinely grateful and not the least bit upset when they talk on the phone later. Thanks for you kind words! As I said in my comment about, I was feeling a bit insecure about the post just because of how dense the episode is. Deception is a interesting thing, and I do think that also fits in with the window motif, as windows—despite being clear—can also be things that block us off from other things. Barriers between us and the truth, as it were. This was something I was thinking about as I was writing the post; it’s just real hard to get it all in haha.